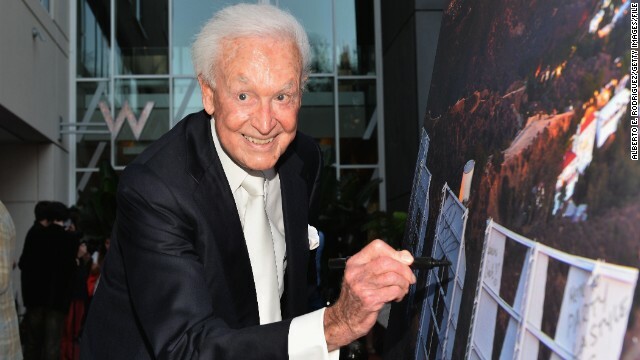 To ring in his 90th year, Bob Barker is returning to "The Price Is Right." CBS has announced that the daytime game show will honor Barker's big day with a weeklong celebration starting December 9. Each episode will put a spotlight on pet adoptions, a cause that's special to the iconic host. On the day of his birthday, December 12, Barker will also make an appearance on "The Price Is Right" and present a special showcase. The long-running game show, which is now hosted by Drew Carey, has been on the air since 1972, with Barker an indelible part of its legacy. The game show host recently retired from the program in 2007. Now that isn't very nice. Can I smell your finger Bob? Im sure you were just touching a woman against her will just a few minutes ago as always. He's 90. Grew up in a different generation. Give the old timer a break. And just in time for Halloween. What a frightening visage. I find myself curious as to the author of this article. 'recently retired in 2007' How is it possible for six years to be recently? If that's a recent pic of him, he looks pretty good for pushing 90. I wonder if he's still a womanizer? Lol! Did you fall and hit your head?..lol. He looks like a botox clown and... "is he a womanizer"? Are you saying you would you like to find out 😉 ? Is he getting your rrrr rolling....grrrrrrr .lmao. Cheek implants. Can't hide that translucent skin on his forehead though. Why would he butcher himself like that? That's just crazy. I just don't understand why people get so carried away with plastic surgery. I don't think there is anything wrong with a little nip tuck here and there, but goodness, let be real. A person don't even have to go under the knife anymore with all the other stuff out there. Whatever floats your boat. He looks like a paralyzed clown without makeup. Sorry, not saying that to be mean. Meeting Bob on The Price is Right was one of my childhood dreams! Keep him away from the women. LoL. He was a horndog in his day. Whatever the undisclosed settlement was with those half dozen or so hotties, he looks like he's doing alright. Lots of great memories of those ladies, I'm sure... You could get away with that in the seventies. My, how times have changed. I'd like to get him a leather wallet for his birthday and treat him to some nice foie gras.